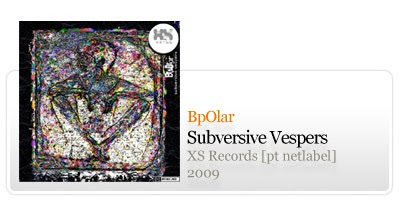 BpOlar is son of a jazz musician and as such he was raised from a very young age listening to the jazz masters, and although is approach diverted from this it is part of his background and as such is part of his aproach to the berlin electronic music scene. BpOlar is also a multidisciplinary artist, creating digital drawings and paintings and 3D video clips to document his music and for live usage, or the opposite (makes music to illustrate video). One of these works is presented together with this release. BpOlar music is strongly focused on creating textures, with a close relation with ambient music. This textures are nonetheless rough and arid, and lead us to alien environments where beats, noises and voices all create suspense moments, where you feel alert all the way through. This release is composed of four tracks and a bonus movie, that complements this particular vision. If you pay attention to BpOlar work you'll find, in his drawings/paintings, movies and music, traces of this imaginary world, where the central element is the feeling of unsettlement.